CooksRecipes has quality, kitchen-tested recipes for vegetarian main dish salads that you can count on for successful deliciousness. A very unique potato salad served with a cheese and chile sauce. Recipe by Chef Jorge de la Torre. 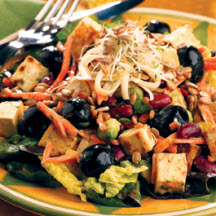 A vegetarian entree salad featuring fried tofu, kidney beans, olives, shredded carrot, alfalfa sprouts and Jack cheese dressed with a fresh avocado and buttermilk dressing. 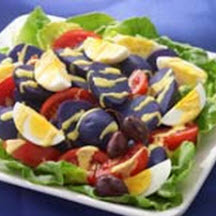 Here's one tasty way to put hard-boiled eggs to use! Serve with bread sticks or crackers for a light supper.